Bologna, is the world’s gateway to the picturesque Emilia Romagna region of Italy’s east coast. Quite recently I flew-in a day prior to boarding a bus to Rimini for the international press ride of Ducati’s new 2018 Monster 821. 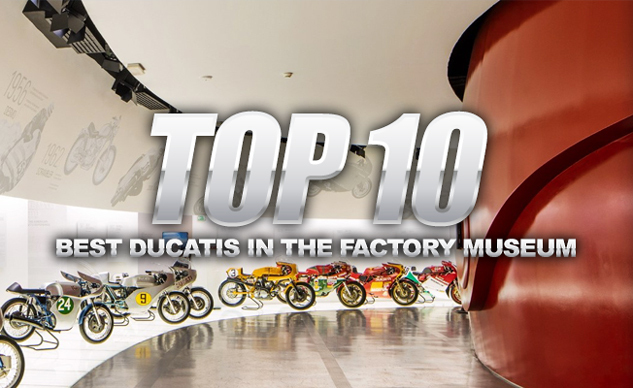 The highlight of that layover was an informal tour of Ducati’s factory museum… what could be better than to take a quick walk over to the Ducati factory from your local hotel in the Borgo Panigale suburb? It’s a pretty nice place, the walk from the hotel is almost park-like, and the factory itself isn’t too large. Best of all, the Ducati folks are a warm and friendly crew. The stylish and modern museum is right on the factory grounds and is definitely worth a stop if you’re ever passing through Bologna. I only had my cell phone with me, so apologies for the hand-held and not-so professionally lit photos. Here are my personal favorites from the visit.